Paul the psychic octopus set to retire? After successfully predicting the winners of the World Cup, Paul the octopus is set to retire. The oracle octopus correctly predicted Spain would win the World Cup by picking food out of a box with Spain's flag on it -- choosing it over the food in a Netherlands box. Paul, who resides in a Sea Life aquarium in Oberhausen, Germany [ ], received death threats for his predictions, with some soccer fans taking to Twitter to suggest calamari recipes he could be used in. "I bet every Dutch person wants a Paul the Octopus sushi roll right now," Twitter user Shibuya_Enjin said Monday. PETA Germany has called for Paul to be released into the wild. "It is extremely thankless, imprisoning the intelligent octopus in order to use it as an oracle," marine biologist Dr. Tanja Breining of People for the Ethical Treatment of Animals said in a release on the PETA Germany website. Although his prediction days are over, Paul won't completely retire. Sea Life spokesman Tanja Munzig said he will "do what he likes to do best: Play with his handlers and delight children," the Daily Mail newspaper reported. With a perfect eight on eight record, Paul was only wrong once -- he incorrectly said Germany would beat Spain in the UEFA [ ] European Football Championship finals. He was given a replica World Cup trophy Monday for his perfect streak of correct predictions during that tournament. Sadly, nobody had no answer to the most important question: How did paul do it? "From a rational point of view I have no explanation why Paul had a one hundred percent hit rate during the World Cup. I think mathematicians found out that 0.0 something percent was the likelihood of Paul being right. I have no idea," said Sea Life spokeswoman Tanja Munzig. "Maybe it's his nine brains, maybe he is just a soccer expert. Only Paul knows." 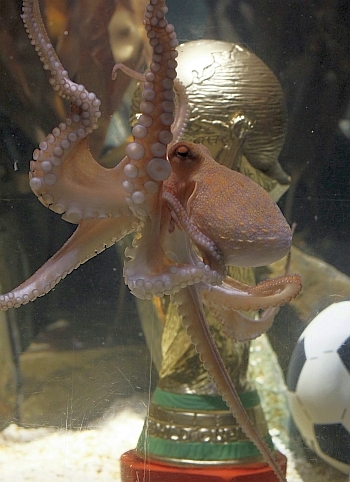 Image: Germany's oracle octopus Paul swims in front of a mock World Cup trophy at the Sea Life Aquarium in Oberhausen.